HotForex is an online trading broker which provides its clients with access to several key products, such as Forex (or currency pair trading), Indices, Shares and Commodities. There are also a few CFD options, and if you join them you can access markets around the world, including the USA and Europe. Reward options are available, and there are plenty of useful trading tools and platform options to choose from. Please remember that you can lose, as well as gain, money whilst trading online. There are plenty of useful trading tools and platform options to choose from. There are various accounts to choose from, each suited to different trading requirements and preferences. The Micro account allows a small ($50) minimum deposit, whilst offering huge leverage (1:1000 - default leverage of 1:50. T&Cs apply) and variable spreads, making it useful for new traders who don’t want to risk a lot of capital. The Premium account offers a greater number of maximum simultaneous orders but requires a higher ($500) deposit, whilst the Zero account provides lower leverage levels (1:200 - default leverage of 1:50. T&Cs apply) but no spreads (literally 0 pips). There are several others to choose from, so it’s worth considering what you want from your account. If in doubt, you can send the team a message to see if they have any suggestions. There are also plenty of options when it comes to the trading platforms available. You can download HotForex MT4, which utilises the MetaTrader 4 platform. A WebTerminal option of this is also available. Alternatively, try the MetaTrader 4 MultiTerminal for a variety of market and product trades. 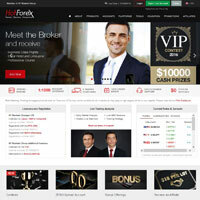 Several mobile platforms are also provided, including HotForex for iPhone, iPad and Smartphones. Combined, these platforms allow you to trade at home, work, or on the move, storing data and creating graphs to help you judge the markets. Collate data and build technical graphs on one of eight trading platforms. Plenty of useful trading tools are available on HotForex.com. These include exclusive market analysis articles, a client area and trading board to share your tips, automatic trading options (whereby you can copy the actions of other traders), an economic calendar and one-click trading. There are almost twenty tools listed, so they’re worth exploring to find out if they can help you along your trading career. We were particularly interested in the Auto Trading features and message boards, as these can help new traders to better understand the ropes, with guidance from other successful traders. Hot Forex is very proud of their quotes on Forex pairs, which are provided to five decimal places. This means more accurate pricing and the opportunity to make the most of your investments, without so much rounding up and down on prices. There are several key currency pairs to choose from, including AUDUSD, EURCAD and GBPUSD. Invest in major global markets including those in Australia, the UK and USA. Daily market conditions and expiration dates are readily available to help inform your decisions. At the time of this review, tick values of $1 per lot, with a contract size of 1 per lot. You can also view swap prices (long and short), limit and stop levels. Invest in global businesses or individual product markets, including metals (gold and silver) and energies such as oil and natural gas. Contract For Difference (CFD) options are available, allowing you to invest in soft commodities such as sugar, corn, coffee and wheat. Again, share deals include prices accurate to five decimal places, with easy tracking on immediate changes. Commission charges may apply. With plenty of useful trading tools, a variety of flexible trading platforms, various reward options and low spreads (accurate to five decimal places), Hot Forex has a lot going for it. The account types on offer also mean you can alter your approach as you develop as a trader, making it particularly useful for new and improving traders. We were also pleased to see several community features. That said, the actual trading options can be a little limited at times, and information on the pricing and options available isn’t quite as transparent as we’d like. Those things considered, HotForex seems like a solid choice, and is definitely worth exploring for its tools, platforms and communities.